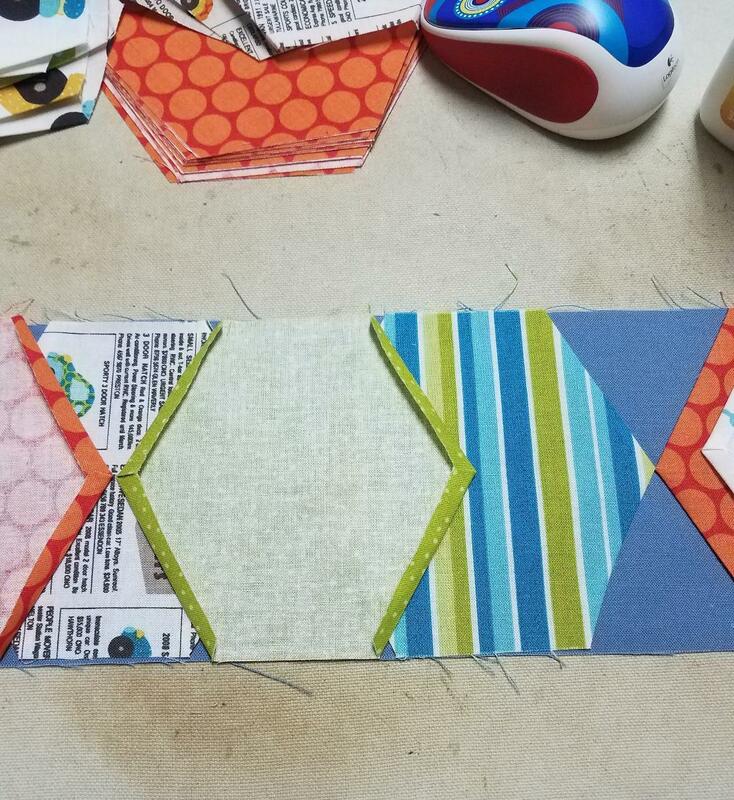 Do you love the idea of Hexagon projects, but the actual cutting and sewing of hundreds of odd corner triangles makes you want to cry? Until recently, I felt that way too. I've discovered a better way! I call it Seamless Piecing. Although it's not technically seamless, the quilt top we are making today only has 8 seams. 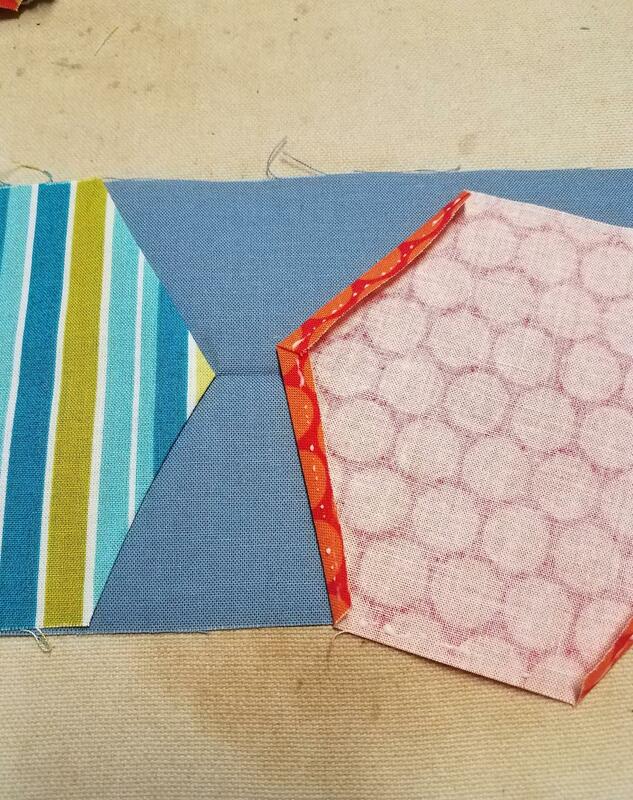 When the Hubs and I learned we were getting our first grand daughter after 4 grandsons, I really wanted to make her a Hexi Quilt. I'd been hoarding fabric just for this baby girl. 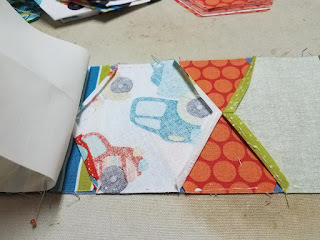 I love hexagons quilts, but when it came right down to it, I realized I only knew 3 ways to build them: hundreds of little triangles, hundreds of Y seams or hand stitching (English Paper Piecing). I was a big, fat thumbs down for any of those. Those methods have their place, but I wanted something easier, faster and seam ripper free. 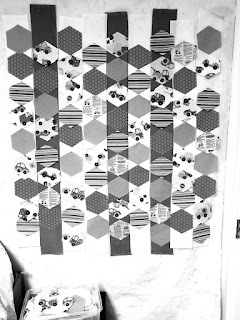 After researching and perseverating for days, I woke up one morning and realized I'd just dreamed about a way to make the hexi quilt without ripping out a single stitch. Since then, I've adapted the Seamless Piecing technique to other angled shapes as well... like tumblers and triangles. 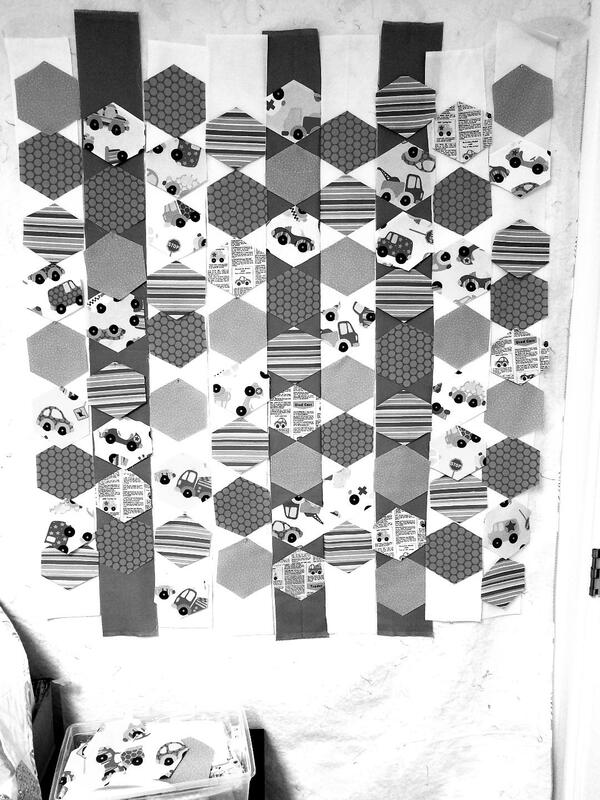 Seamless piecing is easy, fast (or at least faster than all those nasty little triangles) and so much more fun than all those pesky seams and crazy angles. The more I play with it, the more fun it gets! A few special tools are required, but once you have them, you'll wonder how you ever pieced with out them. 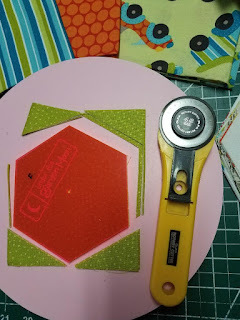 Today I'll show you how to do all the prep work for Seamless Piecing with Hexagons. During the week you can finish the prep. Next time we'll finish piecing and quilting... at the same time! That will give me a chance to order some cotton batting. It's on sale at Connecting Threads this month. Ready to play with hexagons? Wipe away those tears and let's do it! Read Everything before doing anything... Just sayin'. This quilt requires 77 "charms" size 5"x 4 3/8". It's fun to have a few extra to put on the back also. 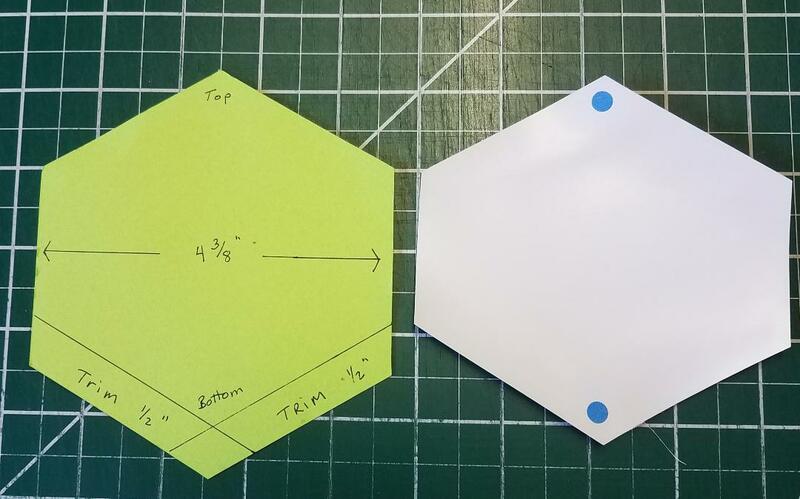 Hexagons are taller (tip to tip) than they are wide (side to side). Therefore, if you choose to use fat quarters: 1 FQ = 16 Blocks from non-directional prints, but only 12 if the pattern runs with the grain. 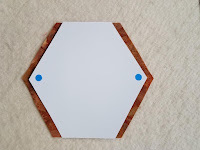 Acrylic Hexagon template – I recommend cutting your hexagons from 5" squares with a 4 3/8"
(2 1/2" sides) template. They are the perfect size for each other. However, you can use any size you want. The technique is the same. Just adjust the width of the background strips to match the width of your template. 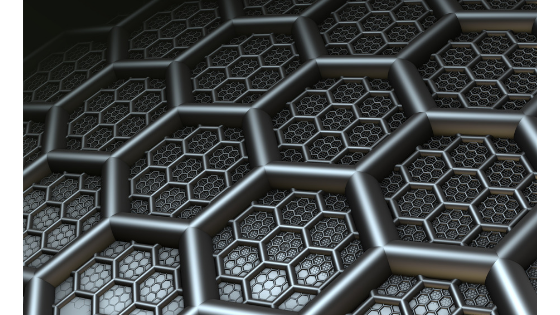 Remember that hexagons are taller (tip to tip) than they are wide (side to side) so be aware of directional fabrics. No-melt mylar template plastic or lightweight cardboard or cardstock. Washable School glue with microfine applicator tip. 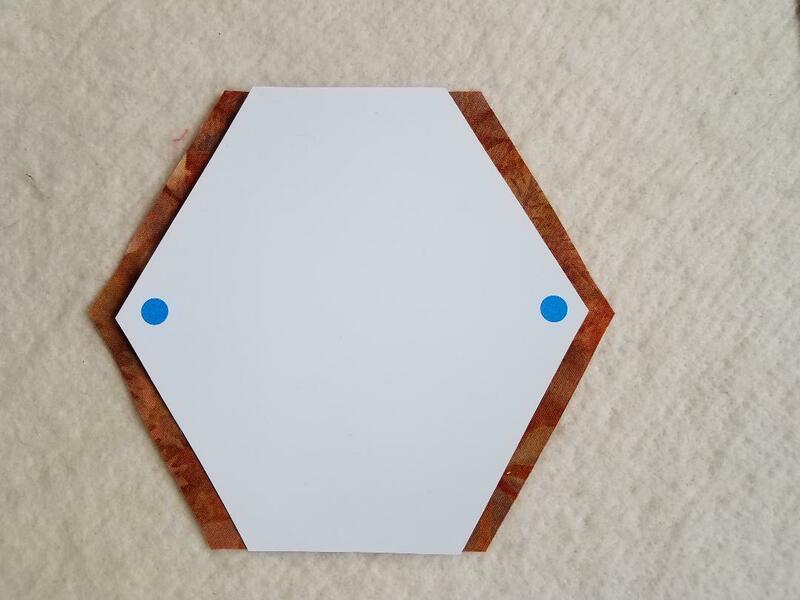 Using the acrylic hexigon template and rotary cutter, cut a template from the no-melt plastic or cardboard/cardstock. If using the cardboard or cardstock, you may want to make a spare while you are at it. Paper degrades when used around liquids like starch. Mark one point to be the top of the template. Just a dot is fine. Using a straight ruler, trim ½ inch from the 2 edges adjacent to the point opposite the the top point. Mark that point as the bottom. Top and bottom are interchangeable but none of the other points are, so be sure and mark them. It's useful to glue a bit of sandpaper on the back of this template to prevent slipping. Cut hexis using the acrylic template (not the one you made) and rotary cutter. A rotating cutting mat and a fresh blade will make cutting a breeze. Press and starch all background fabric before cutting. This will make your fabric easier to handle and help deter fraying. We'll starch the hexi's as we go. Measure your hexi template, edge to edge, not point to point. Cut your background fabric into 9 WoF strips the same width as your template. (10 strips if you plan to put one in a pieced back.) Set these strips aside for now. I find it helpful to label the backgrounds strips, both by number according to the layout sequence and the ends Top and Bottom. So the middle column would be labeled 5T and 5B respectively. Lay out the hexis in 9 columns, point to point. Switch them up until you are happy with the distribution. Don't worry too much about alignment yet, you are just looking for balance. Columns 1, 3, 5, 7 and 9 will have 9 hexis. Columns 2, 4, 6 and 8 will have 8 hexis. If you are using a multi-colored background as I did, make sure you take that into consideration. Once you are happy with the arrangement, it's a good idea to take a photo for reference. You'll need a hot, dry iron for this step. This is where that silicone finger tip will be useful. You'll also need the pressing template, starch in a mist bottle (recommended) and a firm pressing surface. Place a fabric hexi face down on the pressing mat. Spritz with starch and press. Center the template onto the hexi with the edges even with the fabric and a ¼ inch seam allowance showing on top and bottom. Using a stylus or other tool, lift up the seam allowance on one side and fold it over the template. Press well. Lift and press the adjacent seam allowance creating a nice pleat at the point. Put a tiny dot of glue in the pleat and heat set. That pleat will make the point lay flat and pointy. Rotate and do the same thing on the other end. Remove the template. Spritz the seam allowances with starch and press for a crisp fold. TIP: I find it easier to press the points in batches, one column at a time. Take a photo so you don't have to worry when they get out of order... and they probably will. Choose the middle column (#5) of your project to assemble first. All other alignment will be based on this column, so make sure it is accurate. Mark the center of the background strip lightly with a pencil on the wrong side of the fabric, then press a light crease at that point and also lengthwise down the middle of the strip. Lay the strip right side up on your pressing surface and place your hexis from the design wall along the strip, keeping them in order, also right side up. 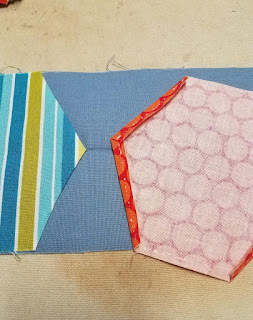 Find the middle of the center hexi by folding it in half, finished tip to finished tip. 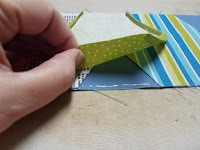 Apply a micro fine bead of glue on all 6 edges of the wrong side of the hexi. Place it right side up on the background strip nesting the middle folds of the hexi and the strip. Align points on the lengthwise crease. Hexis are lined up correctly when their raw edges are even with raw edges on the background strip, the points are "kissing" their neighbors and straight in line on the lengthwise crease. It's more important to have points exactly on the crease than to have the raw edges even. I mean ... if you have to choose. Continue adding the first group of hexis to the background strip until all nine are glued. Before setting the glue, recheck that everything is how it should be. Heat set the whole column. 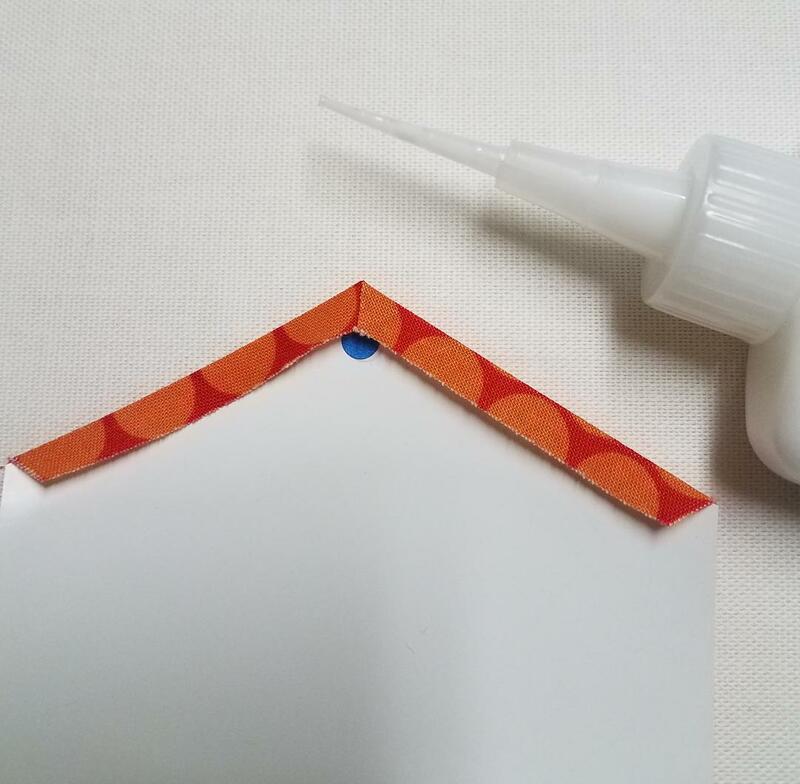 Heat Setting tip: When using this tiny amount of glue, a quick press of heat will set the glue and make it strong and tacky. If the press is held too long, the starch in the glue will “cook” and flake away. Pieced back tip: If you are putting a background strip on the back, prep it now the same way as this first column. Machine applique the hexi's before sewing them into the piecing. Working with one adjacent column at a time, bring the hexis to the pressing surface. You don't need the background strip yet. Place the hexis, right side down, on top of the hexi's of the previous column. Check your photo to keep the hexis in order. Stagger the hexis so a raw edge is right sides together with the edge of the background strip. The finished sides of the hexis from both columns will intersect ¼” from the raw edge of the background strip. Without nudging anything out of place, apply glue to the right side of the raw edges . Readjust points if they get disturbed. Heat set the seam allowance. Prepare a background strip as before with the center marked and a crease down the middle. Match the center marks of the two background strips. Right sides facing. Put a pin there. Then lay the left half of the new background strip, right side down, over the left half of the row. Keep the right half of the row open as far as the center pin. Working a few at a time, starting in the center, apply glue to all six sides of the wrong side of the face down hexis. Also put a line of glue in the seam allowance of the face up hexis. Carefully place the background strip onto the prepared hexis a few at a time. Adjusting points as needed, and all the raw edges even. When the first half is done, go back to the pin and repeat toward the other end. When everything is in place, remove the pin and heat set the entire row. Just like magic we have two columns put together and we've not so much as turned on a sewing machine! After I opened them up for inspection I noticed issues with two of the hexis. One was upside down and one had moved out of place. Even though I'd already set the glue it was no biggie to pull apart the seam, pop the hexis off the background strip, and glue them back on. Complete fix in less than one minute. Try that with a seam ripper! Without separating anything, take it to the sewing machine and sew the columns together. From the front, press the seam to one side. As you press, admire how perfectly those hexi's fit together! If there is anywhere the glue has overshot the seam allowance, simply pull it apart with a sharp tug and press as usual. Some kinds of applique glue may need a bit of water to loosen up. Repeat step 6 until all columns are added. Your top is ready to quilt after only 8 seams. Easy! Next week we'll finish the piecing as we quilt. It'll be fun and done! Hit the follow button in the right side bar if you haven't. And if you enjoy what we've got going on here, share the link with a friend. You can also find me on Pinterest and Facebook. Upload a photo of your progress or whatever you are working on. We all want to see! Leave a comment if you have questions ... or comments.